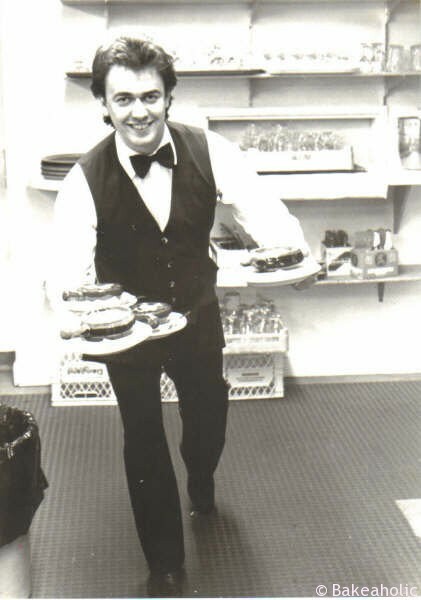 My dad had a sweet tooth – I’m proud to say that I’m certain that’s where I inherited mine from. Father’s day is tough each year, even though it’s been 9 years this upcoming Wednesday since he passed away. It never gets easier – how can it? Instead of celebrating with him, I thought I’d make him something in honour of him, and his sweet tooth. I can remember every night after dinner my dad would want something for dessert, usually we would have ice cream, maybe a fruit salad. When my mom and I would go grocery shopping he would be sure to remind her to “pick up something sweet.” It was the way he would say it, “something sweet” with a grin on his face. 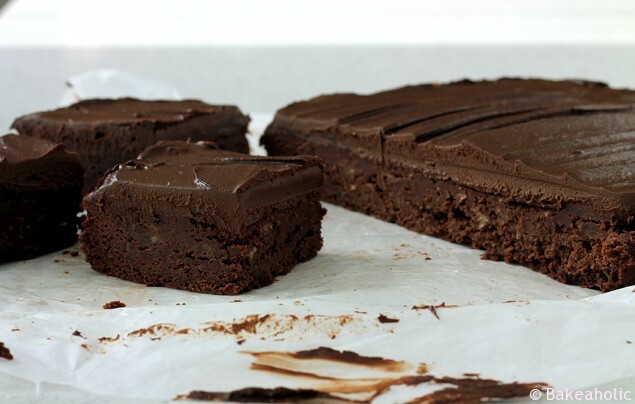 One of his favourite desserts was a deep dish brownie from Safeway, the square one in the tinfoil packaging and clear lid, with a sickeningly sweet thick chocolate ganache frosting smeared on top in such a way that it left a distinct pattern. I’m fairly certain it didn’t last more than one night in our house. I can’t remember the last time I had one of those. 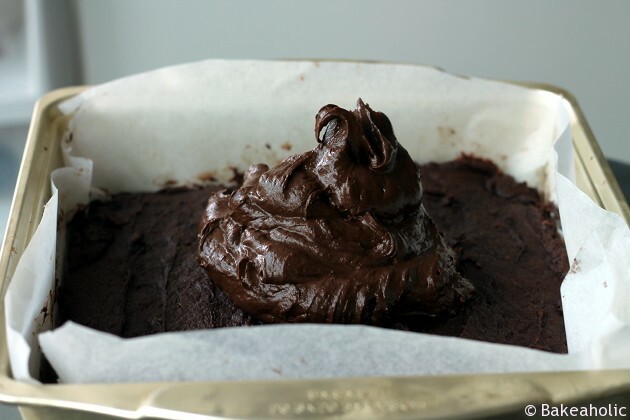 I thought I would make one of his favourite desserts to celebrate father’s day this year. And while I no longer have my own father, I am very thankful to have two father figures in my life who are there for me always. These are a much healthier version than the Safeway brownies, but I think my dad would have approved of them for his sweet tooth craving. 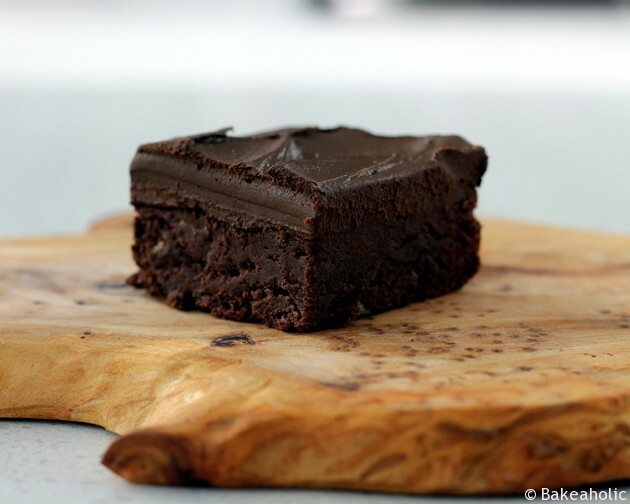 The ganache is decadent and silky, and the brownie is almost like fudge – sweet tooth satisfying. If you’re lucky enough to celebrate father’s day with your dad this year, be sure to share it with him – and maybe a slice of brownie or two. Preheat the oven to 350°F. Line an 8×8 inch baking dish with parchment paper. Heat butter and chocolate in a small saucepan over medium low heat Stir until everything is melted. Set aside to cool. In stand mixer with whisk attachment, or medium bowl and blender, mash the bananas, vanilla extract, and sugar. Add the egg and blend again. Add in the melted butter-chocolate mixture and mix well. Stir in the flour mixture and blend just until combined. Pour batter into the prepared pan and bake for 20 minutes or until a toothpick inserted into the middle comes out clean. You want it to be slightly gooey when you check it, not completely dry. If it needs another couple minutes increase baking time. 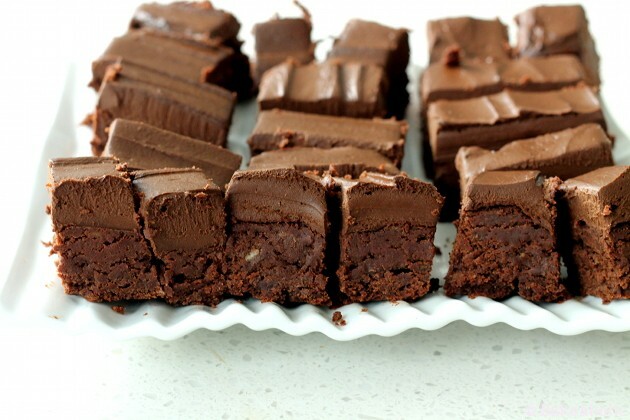 Tip: I always refrigerate my brownies – it makes them extra dense and fudgey. I recommend letting them come to room temperature on the counter, and then cover and transfer pan to fridge for a couple hours, or even better, overnight. For these, you want them to be completely cooled before adding the ganache frosting. I refrigerated these ones for an hour or so, then added the frosting then refrigerated for another couple hours, or overnight. Cut avocado in half, remove skin and pit from avocados and scoop out the flesh. In a food processor, add avocados and puree until smooth. Alternatively, you can blend it in a blender. 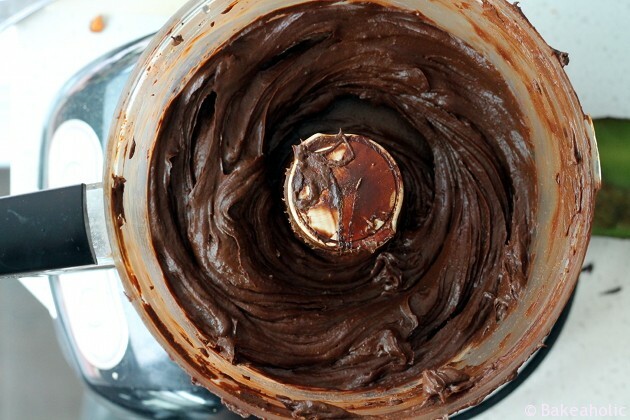 Once smooth, add the cocoa, melted chocolate and honey and blend again until smooth. Mixture should be thick and glossy. 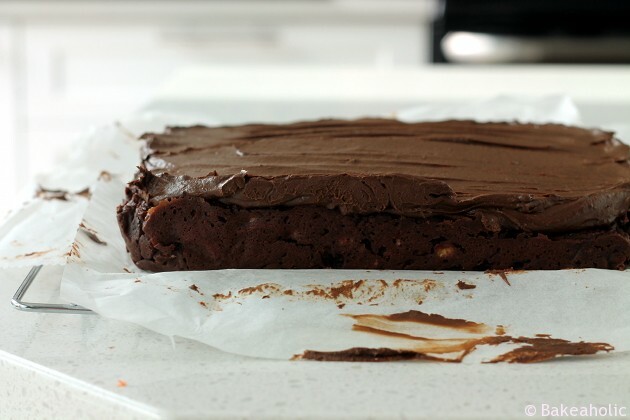 Scoop onto cooled brownies and spread evenly over top. 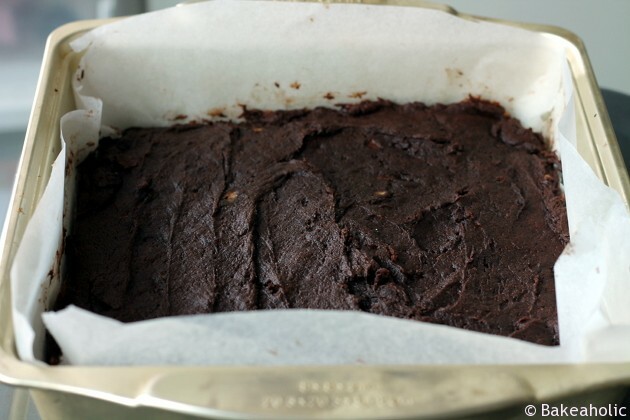 When ready to serve, take out of the baking dish by lifting the parchment – cut into squares and serve. Refrigerate any leftovers in container. I have never heard of ganache before. Looks really creamy, plus you get the healthy advantage of the avocado in it. Will have to try this sometime. 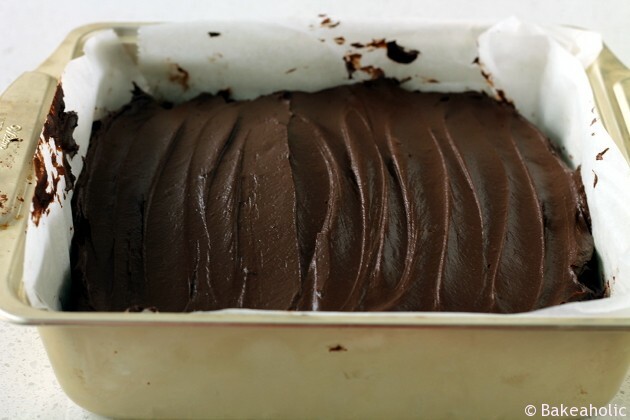 It’s like a thick chocolate frosting, usually it’s made with heavy cream and chocolate. It sets up nicely, almost like fudge! Last summer I made banana brownies by accident. I was trying to make a chocolate-banana cake. And ended up with brownies 🙂 But I wasn’t complaining. 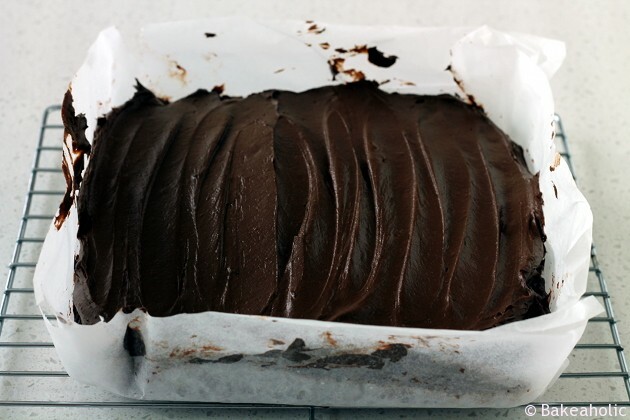 Yours look fab & love the avo ganache! I use it in chocolate mousse and it’s wonderful to replace some/all the butter/cream! Oh my GOD. These look incredible!!! Going to make these and most likely eat them all before anyone even knows about it. Drooling! Thanks!! I definitely ate a large portion of this pan myself.. oops. Now I’d like to show my respect for your dad, but I’m not sure how.. So I’ll just say that I think it is very sweet (and good!) of you to bake something in his honour.